When you have a capacity, people find a way to use it. I know now that all Christians are more alike than they are different. The things in which we differ are few but strongly held AND by focusing on them they appear to radically differ from those over there who (as they differed from us) must therefore be wrong. There is a safety (even smugness) in such certitude. One of the problems with such is that it promotes the opposite of the thing desired or at least claimed. Certainty is not faith! In truth certainty is the very opposite of faith. The Epistle to the Hebrews 11:1, puts it like this, Now faith is the assurance of things hoped for, the conviction of things not seen. As a priest, how many times have I have listened to the quasi confession of some believer who tells me their doubts and struggles in following Jesus ending with a line like, “So John, I just can’t live the Christian life!” I say, “No, what you see as unfaith is ACTUALLY the life of faith. The doubt you have is an essential part of the economy of salvation. Because it doesn’t feel certain they feel they don’t have faith. In truth they appear to me to have faith in contrast to those more certain. Tim Powers tells a good (though dark) tale in his collection of short stories, The Bible Repairman. I was, of course, intrigued by the title and began ruminating over how and what one would repair. I learned that “repairing” Bibles is actually a side line for Torrez, though I will leave it to you to read Mr. Power’s short story and find out his primary occupation. In a peculiar sort of way, one must accept the authority of Scripture to even want to find a way around the verses that trouble our consciences. Having established a twisted respect for the power of Holy Writ the only way to manage its demands is to stoop to the use of magic. And so, people pay Torrez fifty bucks a pop to neuter the offensive passages. Mark Twain once said it was not the passages that he didn’t understand that bothered him as it was the passages he understood clearly. What would happen to me and you if we simply began to do the things we already know to do? People of faith recognized long ago the sacramental nature of confession. In fact even in this post-Christian/Modern period the State of Tennessee recognizes the power and authority of private confession by statute and actually Tennessee goes even further and criminalized the betrayal of such confidences! What if rather this week we do a moral inventory and throw out those things that trouble us, deal the people we hurt or who hurt us. If after that, for any heavy lifting call a discreet priest and let him/her take out that particular garbage for you. Really, call me, it comes with your baptism, really, it’s on the house! I promise. I faithfully kept a blog the last time I was on sabbatical but upon returning I allowed the tyranny of the immediate to crowd out my writing. Again I am about to enter sabbatical and again I am launching a blog. I propose this time to focus on my principle concern, to explore the ancient ways of soul work and how to best interpret that practice into my present work as rector of an Episcopal parish in the second decade of this century. History has been one of my favorite subjects and since everything and everyone has history I am interested in almost everything so long as it has a story. I am an Anglican today because of the rich tradition and sense of continuity with the ancient church. Tradition is ill-served by its friends and despised by its enemies, though in fact neither group appears to be overly acquainted with its riches. Fr. 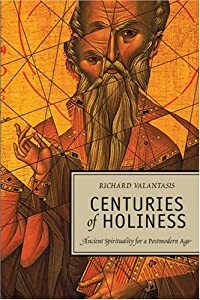 Richard Valantasis writes in his book, Centuries of Holiness: Ancient Spirituality Refracted for a Postmodern Age, “Tradition is the action of the Holy Spirit making available the wisdom of the past in a new idiom and a new time.” I will share from this work over the months ahead. Almighty and everliving God, ruler of all things in heaven and earth, hear our prayers for this parish family. Strengthen the faithful, arouse the careless, and restore the penitent. Grant us all things necessary for our common life, and bring us all to be of one heart and mind within your holy Church; through Jesus Christ our Lord. Amen. I suppose one of the good things about rising age is the perspective we gain from traveling over that much geography. One of my favorite writers, Morris West, titled his memoir, A View from the Ridge, looking back over his life just before slipping into the valley beyond, while I am not yet on the ridge I can look back over a few foothills. This is the tenth time I have attended an annual parish meeting at Saint John’s. Ten years is a long time. I was 51, I had hair and I couldn’t have known how much fun I would have here. As I look over this nave, I can almost see in their old accustomed places some who welcomed me in 2002 and have gone before us into that perfect rest. * Sam Givens, who at 92, took up tap-dancing to meet chicks. * Sara Jane Pantero wrote the date beside the hymn every time that hymn was sung in church. The choirmaster-organist Geoff continues that practice in her hymnal. * William Cox knew every animal at the Memphis Zoo, their mate, their progeny and all their names. I treasure the tour that he and June gave Marilyn & me. * Carol Cobbler – a force of nature, instructed me in the family secrets of old Memphis. * Diana Caro, who on her deathbed, called her financial adviser & moved money in 5 figures to the memorial fund in honor of her husband & daughter who preceded her in death and waited to embrace her only hours late. They & many others have departed this life in the faith and fear of God, waiting for that great day, when we all will be with Jesus and he will wipe away all tears, grief and pain. In the communion of the Saints all those who ever loved God in this place, join us this morning as we gather to order our common life. This is the thirty-first annual parish meeting I have conducted since my ordination today I find I have a peculiar clarity, almost high definition, view of this Christian experience we share. * My job is Rector: I was made chief steward of this place ten years ago, to husband the resources, to guide and serve this community until I surrender this privilege to the Bishop at some future day. I intend to deliver this institution into his hands hopefully a little better than I received it. This is myjobas Rector. * On the other-hand my work is “the cure of souls.” I was installed as rector in September 2003 with precise & archaic language. I was given “charge of the cure.” It is not unlike being a “player-coach” in that while I do my soul work, I also coach others in their soul work. One would think that my job & work would correspond exactly and I say with sorrow that such is often not the case. The tyranny of the immediate, the speed of communication & the maintenance of the fabric of the institution often obscures distracts me from the deepest concerns of ministry. 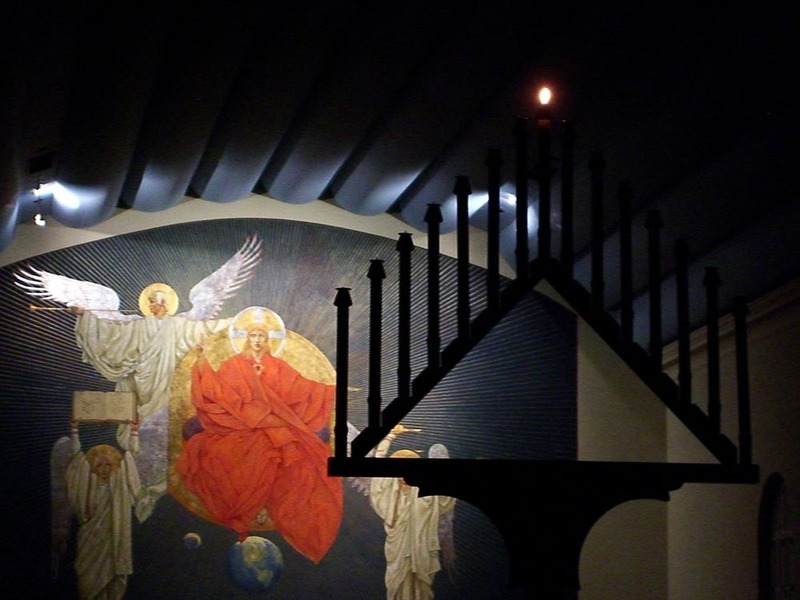 For several years now, I have admitted to myself that while the institution of Saint John’s is thriving by some measures, especially given the chronic anxiety in society, soul work is not the focus of our common life in a way that deeply transforms lives. Yet, the simple truth is that this place exists for one purpose and one purpose only: that here people safely experience God. That is why this room is filled with world-class art, better music than I have ever dared hope for and indeed treasures of all the arts making this Church aesthetically exquisite. Since meeting God in the breaking of the bread is the most important thing a believer can do all week, liturgies are thoughtfully planned, altar carefully prepared and buildings faithfully cleaned because the worship of God deserves no less. This place, this beautiful place, this “home place” is serves as – an open space – where we, in a great ­­­­­­­­­­­­­­­­­­­­­­­­­­choreography of grace, dance with God & each other on Sundays & Holy Days. And yet, more is needed. For a long time I have sensed that how we have done church, the way I experienced church as a boy, is no longer working. Each generation faces the unique challenges that comprise life in that day. We are no different, but discerning the signs, it appears that we live at a cadence point in history. Naively I thought that modern went on forever. But, what we call modern is no longer the cutting edge of speculation and innovation but is the label of a history, like the Victorian age or Colonial era. Not all generations’ live through at such a cultural pivot, but we do. In 70 AD the Jewish Temple was burned & Jerusalem destroyed. Believers faced the question, “What does it mean to follow Jesus now that the cradle of the faith is gone?” They adapted, reinvented themselves and set about the conversion of the Roman Empire, proclaiming the resurrection of Jesus, the Son of God. In the 4th & 5th centuries the Roman Empire in the West collapsed. Christians adapted and set about the conversion of Europe. I believe that the end of modernity is such a time – a reinvention must occu if the Gospel is to go to the entire world. For the past 500 years we have done church pretty much as we have experienced it in our life time. But that way no longer works. The day when the culture propped us up is no more, the public schools are no longer the Protestant parochial schools & Blue laws no longer protect us from competition; no longer can we prosper by a sort of genteel ignorance of the faith, hiring people in collars to do our Christianity for us. I’m not saying folks were not Christian & I’m not saying that they were unconcerned about faith. What I am saying is that the future requires a kind of commitment and formation that we have not needed for centuries. Living forward, each believer will need to be self-feeding, taking responsibility for the health of her or his soul. We have not done that sort of intentional soul work for a very long time. Before, we worshiped in our several churches, sitting on various corners, waiting for folk to wander in. Now, they no longer seek us out and we are at a loss as to what to do. For we live at the end of a chapter of history, the page is not yet turned but we prepare for whatever this next chapter brings. Let us not succumb to a fixation on survival, a sure and certain path to death, no let us rather embrace the adventure ahead of us, for the plot thickens and The Holy Spirit will guide us as Jesus promised. o What is the Spiritual health of Saint John’s? o What is Saint John’s role in the formation of souls? * In March, we will receive the results. * A team of Saint John’s communicants who will work with this material over a period of months. * By late spring, they will advise us how best to proceed given what we have learned from each other. Ask questions, go online & read about Episcopal Spiritual Life Renewal. Above all, please take this survey. I am hopeful today in a way I have not been in a long time. I want to invest my remaining years of public ministry in this place. Paul in his letter to the Christians at Ephesus, speaks to us also when he wrote, “Ephesians 4:11 The gifts he gave were that some would be apostles, some prophets, some evangelists, some pastors and teachers, 12 to equip the saints for the work of ministry, for building up the body of Christ, 13 until all of us come to the unity of the faith and of the knowledge of the Son of God, to maturity, to the measure of the full stature of Christ. Almost thirty years ago I dreamed that I was a member of a Christian community and we were planting an orchard. I never forgot that image and increasingly I have sense that you are that community and Memphis is that orchard. Beloved, let us journey on together. Amen. Forty days after the resurrection Jesus ascended into heaven thus ending the days of his incarnation. Authentic renewal can only occur by going back to the original sources of Christian inspiration — most notably, Scripture grounded in the Church’s Tradition as well as the Church Fathers–and then using this as a basis to think about the present.